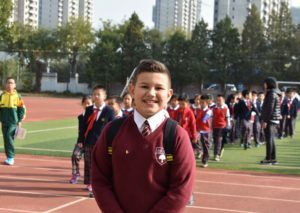 Pedro Periera , a year 5 student from Berrymede School in Ealing enjoyed a life changing visit to Beijing China, during October half term 2017. He spent 3 days in a primary school in North Beijing, accompanied by his mum, Headteacher and Class teacher. Pedro was treated like a movie star during his time in the school , lead some English lessons, learnt Chinese and practised basketball and other Chinese sports. Pedro said ” I really enjoyed my visit to Beijing, the Chinese children were so kind and I have many e-mail address” .